Fancy storing all 13 security applications to keep your computer safe and sound from nasty external attacks and viruses on a single USB flash drive? Yoggie Security Systems has just released such a device known as the Yoggie Pico, giving computer users (notebook or otherwise) full corporate level Internet protection from all types of hacking, virus, malware, worms and other attacks – both current and future – while boosting computer performance by saving CPU, memory and disk space. Prices start from $180 onwards, depending on the Personal or Pro versions. Linksys now has a Wireless-G USB adapter with a built-in WiFi finder allowing you to locate a hotspot without having to boot up your laptop. The Wi-Fi Finder detects Wireless-G and Wireless-B networks with a simple push of a button. It displays all pertinent information such as the wireless networkâ€™s name (SSID), signal strength, the channel used, and whether wireless security is enabled or not. The information is displayed on an easy-to-read LCD display and can be set up to look for only open networks, all networks, or a specific named network. Discovered networks are listed in order of signal strength. The adapter also uses search technology thatâ€™s smart enough to filter out 2.4GHz interference from microwaves, cordless phones or even Bluetooth devices meaning youâ€™ll only get a list of actual Wireless-G and B networks. 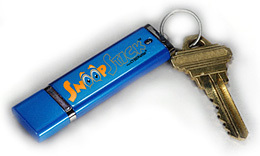 The SnoopStick is a USB flash drive apparently designed with the intent of allowing parents or employers to keep an eye on what their kids or employees are doing online. Just plug the SnoopStick into any USB equipped PC you want to monitor and then run the setup program which takes about 60 seconds. The software that gets installed is completely invisible leaving no evidence that the system is being watched or monitored. Once installed on a system you can then monitor that computerâ€™s online activities anywhere in the world by simply plugging the SnoopStick into your own PC. You can see what websites have been visited, check who or where emails have been sent and even read IM conversations as they happen in real time. The SnoopStick will even store up to 12 months of activity logs if you donâ€™t want to keep an eye on the other computer all the time or if you happen to need a bit of evidence later on. Most of our keyboards are powered when plugged into the computer, but how many of them actually harness the power of the sun? The Genius SlimStar 820 boasts a solar panel that juices up the built-in battery, helping you save on your power bill in the process. Granted, the amount of energy consumed is marginal, but imagine what would happen if everybody across the globe did the same thing? Millions could be saved each year, where the money can then be channeled for other altruistic causes. 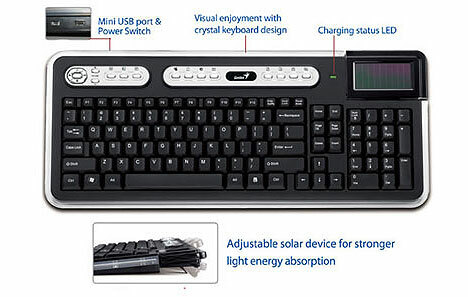 In the event where there is not enough light, the keyboard will automatically be powered by the USB cable charger.